My Art revealed! I can show you now! The girls passing them around admiring each other’s collage. 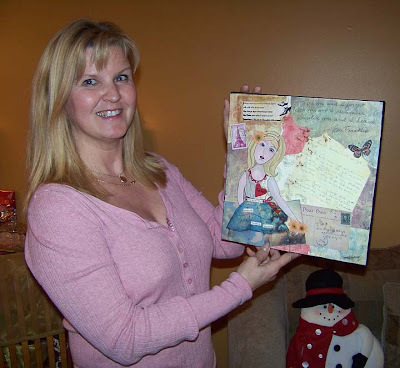 Terri and her mixed media collage. 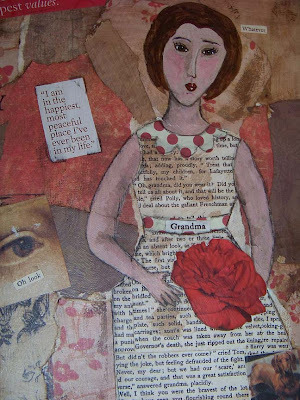 Her red and brown canvas had a theme of being a grandmom and family. This lovely woman is so young an already has 7 grandchildren. She’s a saint! She also hosted our beautiful Christmas party this year and it was really wonderful. Thank you, Terri! 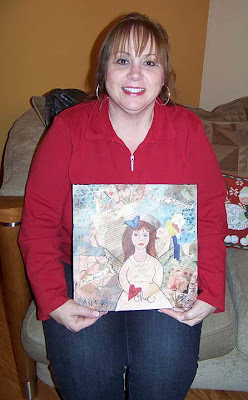 Sharon and her mixed media collage. 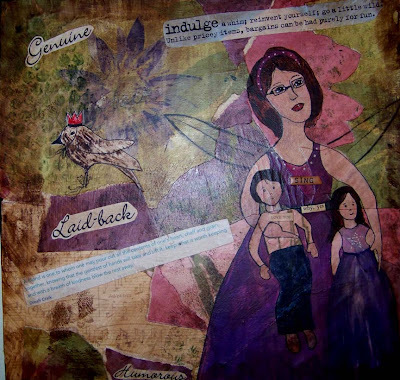 Her purple, pink and lime green canvas had a theme of motherhood. She has two young children and I included them for extra specialness! 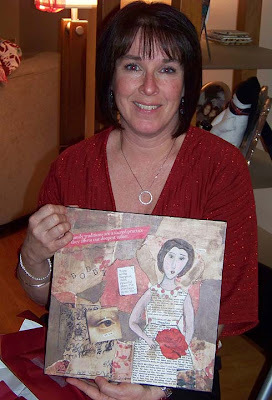 Liz and her mixed media collage. Liz’s bright color canvas had a theme of vacationing in Ft. Meyers, Fl, her family and her dog. 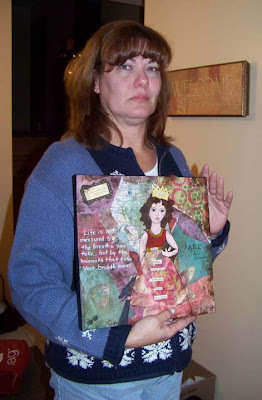 Laura and her mixed media collage. 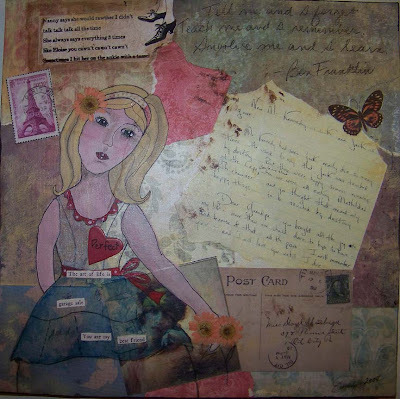 Laura’s blue and mauve canvas had a theme of men and playing poker with snippets of other things she loves to do peppered in. 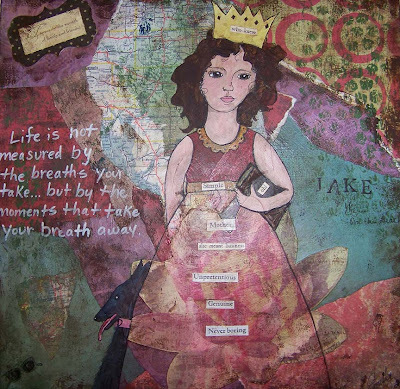 Cindy and her mixed media collage. 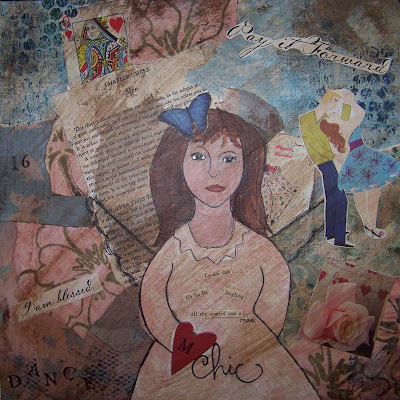 Her pastel collage was of a gardening theme with touches of Jackie Kennedy, an excerpt from Eloise and her favorite quotation. 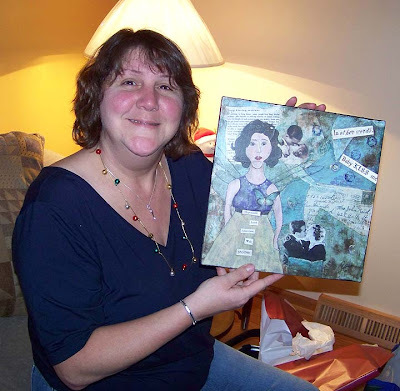 Cathie and her mixed media collage. 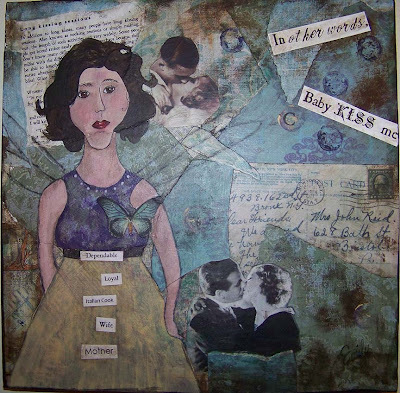 Her blue and green theme was of kissing and watching old movies-two of her favorite things to do! On Friday night I gave my girlfriends their personalized mixed media collages that I’ve been working on for the past week. I was anxious to hand them out. I was also a bit worried what their reaction would be, since I wasn’t sure if they’d like them and my husband made me feel like these might not be something they’d even want to have. I was wrong and my husband was even more wrong. Everyone was very touched and so happy to get them. It gave me encouragement to carry on and make more. This is a new, artistic avenue I’d like to continue going down. With this kind of art, there’s so much room for possibility and themes and different elements to use that you really can’t get bored with it. There’s so much out there in the world to use like old photos, old letters, maps, and more. And combined with my drawing skills it’s almost limitless and it’s just so exciting! 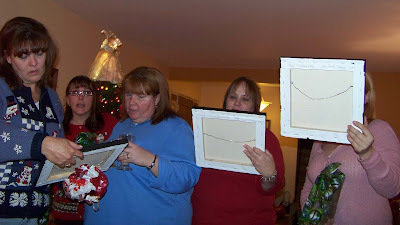 Here are photos of each woman and her completed collage. I made them on 12″ X 12″ stretched canvas. 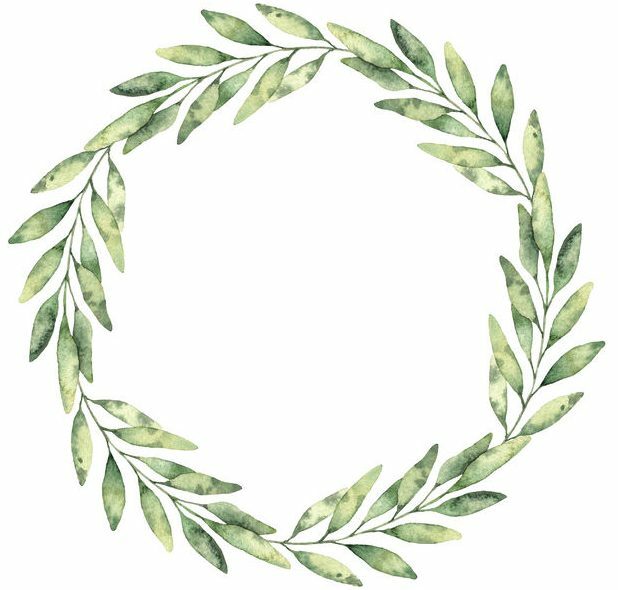 I asked each woman to answer ten questions that ranged from what her favorite colors are to giving me a few words which described her personality to what is the most blissful thing she could think of . These questions were the basis for my theme and I personalized it further with a drawn and painted likeness of each woman. Most of them I did from memory. These woman have been in my life for almost 40 years. I know their faces well! Wow congratulations they really are fantastic. I would be so honored to get one too if I was one of your friends. They look happy. Well done and keep going I think you will do really well with them. I think all men would say the same thing – its a girls thing for sure. 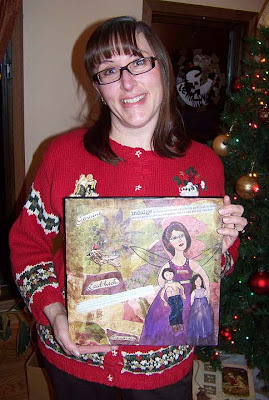 Em, you outdid yourself & I know your friends loved your art AND your thoughtfulness! Each piece is unique & beautiful! So are your FRIENDS! No WONDER you said in an earlier post that you were so immersed in creating! Were the collages what you you working on? They had to be lots of fun to create! Wow way to go!! What a special gift for your gal pals! You did a marvelous job!! Em, I’m still reeling in the awesome wonder of my gift. It’s above my desk so I get to look at it all day. I really can’t get over how our faces match the drawings you did. I truly appreciate the love, time and effort you put in it! You are an amazing woman!